Are there luggage restrictions to fly to Galapagos? There are luggage restrictions for flights to Galapagos: a maximum of 20kg and one piece of luggage per person. Please note that the National Park strictly controls luggage. If you plan on bringing food, please check with us first. Within the Galapagos are propeller planes that connect Baltra, Isabela, and San Cristobal. If your itinerary involves a local flight please note that the maximum allowance is 11kg and there are no storage facilities at the airport. Do I need an updated immunization record? Not required for entry to the Galapagos Islands, but check if you are travelling in mainland Ecuador or other South American countries. There are daily flights from the US and Europe to Ecuador, both to Quito and to Guayaquil, the main points of entry to the country. Click here for a map of the Galapagos. Once on Ecuador’s mainland you will need to take an internal flight to the Galapagos. The majority of flights leave in the morning, so depending on your international flight you might need to spend a night in Quito or Guayaquil. There are daily flights to Baltra Island with Tame, Avianca, and LAN. Booking early is recommended. All passengers should have full medical insurance and trip-cancellation insurance. Be mindful that the Galapagos is a remote location with very basic medical facilities at hand. Emergency medical evacuation can cost upwards of tens of thousands of dollars. Your insurance company should be able to assist you with the best options for your trip. Due to the fragile ecosystem there are border controls. Expect your plane to be fumigated, your shoes to be cleaned between islands, and do not bring food into the Galapagos. If you have special requirements contact us for advice. How much of the Archipelago is National Park? 97% of the archipelago’s islands is designated a national park. Human settlements are concentrated on the remaining 3%. There are strict rules about visiting the areas on islands that have been designated as visitor sites by the national park authorities. The Galápagos is also part of a huge Marine Reserve, which ranks among the largest in the world. What are the Park Fees? a) Immigration Control Card: At the airport in Quito or Guayaquil guests must visit the Galapagos Immigration Control desk, show their IDs, and pay $20 per person to purchase their card. Please note that to avoid a double charge the card must be presented upon arrival in Galapagos and kept until departure..
b) Entrance fee: Once in Galapagos, there is a Park Entry fee which at present is $100 per adult and $50 for children. What are the rules and regulations of the Galapagos National Park? You are required to be guided by a Naturalist Guide whose job is to impart information and to enforce all Galapagos National Park regulations. No person can set foot in the Galapagos National Park unless accompanied by a certified naturalist guide. There are steep penalties for breaking the rules and regulations of the Park. Do follow and obey your guide’s discretion. The Humboldt Current’s influence brings cold waters especially during the misty, rainy season (cool weather) from July to December. From January to June “El Niño” current may bring warm waters to the Galapagos and will make the surface warmer and rainfall increase. The water temperature varies during the year. From June to December the southern trade winds bring the colder Humboldt Current north to the Galapagos. This means that the water is cooler, and a layer of high atmosphere mist pervades island skies. Due to the Humboldt Current, this is an ideal time for diving and spotting the big fish. The time period between December and May is warmer. The Galapagos’ climate is more tropical at this time with monsoon-like rains followed by clear blue skies. The ocean temperature is warmer, ideal for swimming and snorkeling. General information Should I convert my currency before my stay? The monetary unit of Ecuador is the US Dollar. There are ATMs throughout Ecuador and on Santa Cruz Island. However, it is advisable to have enough cash on hand for general expenses. IMPORTANT: Please have $20 USD in cash when you check in for your flight to the Galapagos in Quito, which will cover the INGALA transit control card. When you land at Baltra airport in the Galapagos, have $100 USD to cover the Galapagos National Park entry fee, which is mandatory and must be paid in cash upon arrival. Ecuador’s primary language is Spanish, but English is widely spoken by guides and staff at Galapagos Safari Camp. Local time in the Galapagos Islands is GMT minus 6 hours, one hour behind Ecuador’s mainland, which is in the same as Central Time in the USA (GMT-6). Yes we do, at an extra charge. We do assist with drying wet clothes & shoe cleaning free of charge. It is customary to tip guides, drivers, and boat crew. 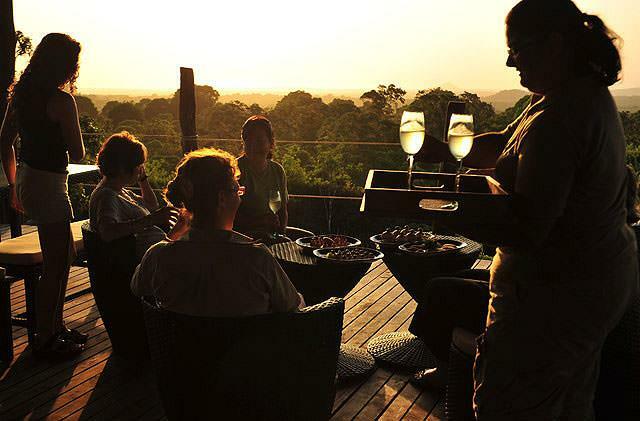 If service is satisfactory, an added bonus for staff members at the camp is welcome. It is difficult for us to make suggestions, as we believe tipping should reflect satisfaction and should not be expected—but we are always asked for guidelines. We suggest $10 per person per day for guides, crew-members on boat trips, and GSC staff members. That would be $30 per person per day. Is there Internet access at Galapagos Safari Camp? Free wi-fi is available in the panoramic lodge at Galapagos Safari Camp; however, the internet connection is via satellite so it can go down for short periods of time and the connection speed is not great. The wi-fi signal does not reach the tents. The bug situation ... be honest. What should I expect? We have nothing dangerous or life threatening in Galapagos. During excursions expect a few mosquitoes and horseflies, but this is seasonal. At the camp there are very few mosquitoes, again seasonal, spiders are commonly seen, and there are a few centipedes but they are shy and hard to see. What happens if I’m injured or become ill while at Galapagos Safari Camp? GSC is equipped with an excellent first aid kit, and local pharmacies are well stocked. There is a local clinic for minor ailments, and for emergencies there is a hospital in Puerto Ayora. There is an air ambulance service should patients need to get to the mainland for treatment. We strongly recommend you come prepared with insurance. We have gravel paths; you will need enough mobility to be comfortable both at the camp and for your excursions. What should I pack for my Galapagos Safari Camp experience? For your daily activities you will need comfortable, light- and sun-protective clothing. Good walking shoes are highly recommended, as a lot of the terrain is volcanic. You will most likely spend time on boats, swimming and snorkeling in the ocean, so protective swimwear is important. We provide wetsuits and snorkeling equipment for excursions. During the day, many people wear shorts and t-shirts, though trousers and long sleeves are advisable. At Galapagos Safari Camp the dress code is casual. In the evening, guests often wear long pants and loose fitting long sleeved shirts, as it can be chilly in the highlands where GSC is located. *Wetsuits and snorkeling gear are provided, no need to bring your own. What wildlife will I see at the camp itself? Giant tortoises area easily spotted roaming in the property. There is plenty of birdlife, including various finches, Galapagos doves, flycatchers, warblers, rails and barn owls. 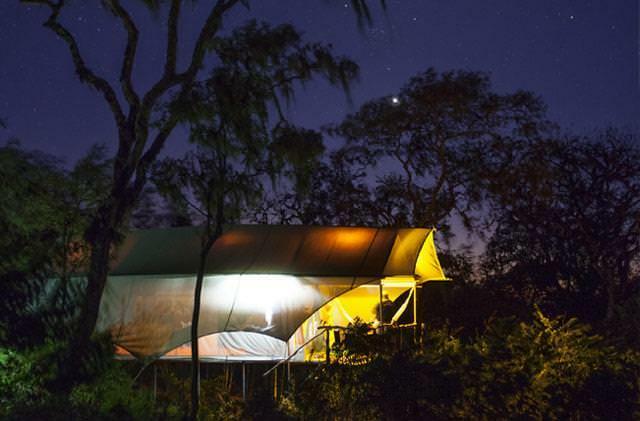 Will I have access to electricity at my tented camp? Yes – the electricity at the lodge and in all tents is 110 volt, 50 hertz, 2 flat-pronged US plugs (same as in the USA). Will my phone work at Galapagos Safari Camp? Cell signal is weak at GSC, and the ability to make or receive calls will depend on your mobile carrier. There is signal for GSM, CDMA, and G3 carriers on Santa Cruz Island. There is a land-line at GSC for emergency use. 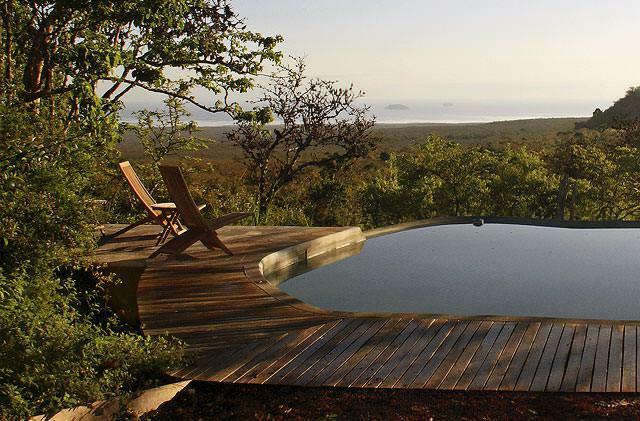 How do Galapagos Safari Camp daily tours operate? This depends on your selected itinerary. As a rule of thumb, land excursions on Santa Cruz Island are fairly flexible and you can decide with your private guide the details of your outings—that is to say, you can choose when your day starts and ends and what activities you would like to incorporate (i.e. biking, trekking, kayaking, swimming). Lunch is served at local restaurants or picnics are arranged. In terms of boat excursions, usually you leave the lodge between 6 am – 8.30 am and you return between 4 – 6 pm. The drive to the embarkation point takes 30 minutes. Navigation time depends on sea conditions and destination, from 45 minutes to 2.5 hours. It is important to note that you will be visiting Galapagos National Park territory, which is highly regulated. The Park enforces visiting places and hours, walking paths are set, and naturalist guides are obligatory. When visiting the uninhabited islands you follow trails with your guide, the tempo is slow so as to observe wildlife, you are very close to the animals, which may be mating, nesting, feeding, or fighting, and it is essential to respect distances and follow your guide’s advice. Lunch is served on-board. After the morning visit there is an opportunity to snorkel or swim in designated areas. How do I plan my Galapagos Safari Camp experience? Visit Plan your Journey that will guide you through the process, or if you prefer contact us and we will gladly assist with any travel arrangements. How do you compare a land-based trip to a cruise option? The first decision you will need to make when visiting the Galapagos is if you want to have a cruise experience, a land-based experience, or a blend of both. The answer will depend on your preferences and priorities. If your ultimate goal is to see as much of the archipelago as possible then cruising is the best option. The advantages are that you will cover more ground (and sea!) and you will see more wildlife. The disadvantages are that you will be limited by set departures and itineraries, you will be in close proximity of other guests for a week, and nights are not usually as restful due to engine noise and boat movement. Sea sickness can be an issue depending on the vessel. With a land-based program you will not be able to visit as many islands, but you will be very exposed to wildlife and will see a great percentage of the flagship Galapagos species. Itineraries are more flexible and easier to customize, the experience is far more tailor-made and private. Nights are more restful, and for families this is undoubtedly the better choice. Sea-sickness will be minimized as boat trips cover shorter distances. A blend of both is ideal.